William Henry Southwell (1823–1870) with his younger brothers Frederick (1833–83) and Edwin (1841–82) traded as the ‘Southwell Brothers’ whose portrait photography was greatly in vogue in London during the 1860s and 70s. Their parents were William Southwell (1804–1880), a pianoforte maker, (son of William Southwell (1736/7–1825, Anglo–Irish musical instrument inventor and maker) and Elizabeth Cuming (1803–1880), who were married in London in 1822, a union which was to last for almost 50 years. Elizabeth died in February 1880, closely followed in July of the same year by her husband. The couple also had seven daughters and we have included brief summaries on the family history of these siblings, drawn from our joint researches, in our Genealogy pages. On a number of well documented occasions the Southwells photographed members of the royal family, including Queen Victoria herself. With her gracious permission, some were published as cartes de visite for sale to the public. Other Southwell sitters whose portraits survive in the this form include countless members of the aristocracy, members of the theatrical profession and luminaries from the establishment. Key points in the history of the business are presented in the summary time line below. An article by Dr. Margaret Debenham which provides more detailed information may be accessed by selecting ‘The History’ on the menu bar to the left of this page. 1857 A number of contemporary sources provide evidence that the business was already in existence at 16, Baker Street this year. 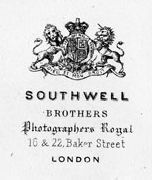 W. Southwell, photographer, first appears in trade directories at about this time. Confirmation that Frederick Southwell, the middle brother in age, was already working as a photographic artist in this year is provided by the birth certificate of his son, Frederick William Robinson Southwell dated 20 November 1857. 1858 By this year, the firm was operating in other areas of photography, in addition to studio portraiture, the field in which they would become best known. Their other recorded areas of activity included the photography of microscopic objects, sporting animals and portraits of the dead. 1860 Contemporary newspaper reports and advertisements record that Mr Southwell visited Buckingham Palace to take pictures of the Queen and other members of the royal family, a selection of which were published later in the year as cartes de visite. At this point the firm advertised under the name 'Southwell and Co'. 1862 A second premises was opened at 22, Baker Street on 31 March 1862. The notice advertising this additional studio was placed under the name Southwell Brothers, providing confirmation of the change of trading name. At the end of the year Southwell Brothers took out an action against a Mr Hayward to protect copyright of their images. 1863 Newspaper reports record the dates on which the Prince and Princess of Wales and the King of the Greeks visited the Baker Street studio to sit for their portraits; shortly afterwards there are reports of a visit by the Princess of Wales, her mother Princess Christian of Denmark (soon to become Queen Consort, Louise) and her sister Princess Dagmar (later Empress of Russia). In July the firm advertised that in future No. 16 Baker Street would be devoted to photographing children and that the department for adults was now situated at 22, Baker Street. It is not however clear if this continued to be the policy in later years. 1864 In March the Court Circular reported that Mr Southwell has attended Marlborough House for the purpose of taking photographs, an indication of continuing royal patronage. 1865 Frederick Southwell married a widow, Kate Isabella Lyon (nee Stewart) on 20 August 1865; however, his first partner, Charlotte Robinson, was still alive at this time. We have been unable to trace a marriage between Charlotte and Frederick and it seems that, although she and the five children of their union (of whom two survived) adopted his name, this was a common-law relationship that was never formalised. Charlotte appears in the 1871 census under the name of Charlotte Bond, along with her two living children by Frederick (Henry Rowland and Amy) and two younger children, registered under the name Bond. She died in 1774 (confirmed by a copy of her death certificate). 1866 In February Southwell Brothers announced that they had three glass rooms at their establishment and in consequence of the fine weather had commenced making appointments. In May they submitted a patent application (No. 1364) for a novel lithographic photographic process for colouring pictures, for which they were granted provisional protection. However, it does not appear to have ever proceeded to full protection. 1867 A third studio was opened on 1 May 1867 at 64A New Bond Street. 1870 William Henry Southwell, the eldest of the brothers died suddenly of heart problems at the home of his father-in-law at the early age of 47. His obituary appeared in The Times dated 7 September 1870. 1871 The 1871 census finds Frederick Southwell and his second family living at 22, Baker Street, with Edwin Southwell listed in the same household. 1872 In August 1872 a notice in the Morning Post reported proceedings commenced in the Court of Bankruptcy for an appointment of a receiver and an interim injunction relating to the bankruptcy of the two surviving brothers, Frederick and Edwin. 1873 A notice in the London Gazette on 16 May 1873 reveals Frederick and Edwin were seeking Liquidation by Arrangement or Composition with Creditors, both in respect of their partnership and individually. What transpired in consequence is still unclear, but it seems that the business continued until 1876. The wording of their father’s will, proved in 1880, suggests that he may have provided funds to satisfy their creditors at this time; in it he specifies that they are to be forgiven any debts they still owe to him at the time of his death. 1876 It appears that the business was taken over by Frederic Thomas Burrows and Joseph Dufais Colton by this year. A reference to the new proprietors of the photographic studio at 22, Baker Street Studio appears in Anthony’s Photographic Bulletin Vol. XVII and the London Gazette carried a notice of a new patent (No. 2274) granted to these partners at this address. 1877 A notice in the London Gazette records that a second set of bankruptcy proceedings were bought against Frederick Southwell, this time in the County of Surrey, with two addresses given, 27 North End, Croydon and 23 Oakfield Road, Penge. See The Croydon Business for examples of CdVs at these addresses. The photoLondon website notes a 'Bill of sale of the business to Richard P. Staines on November 21 1877 £950; Frederick & Edwin Southwell reregistered to Staines November 20 1882 £950'. Also in this year, the firm of F.T Burrows too ran into financial difficulties and instituted their own proceedings for Liquidation by Arrangement in respect of their business at 22, Baker Street; according to the photoLondon website the business passed to William E. Gibb on 9 May 1877. Possibly both sets of difficulties were related to a court case, Southwell v Scotter, which has become widely quoted case law relating to landlord and tenant disputes. It seems this complex case, which reached the courts in March 1877, related to the Southwells having sub-let the top floors of 22, Baker Street to a Miss Sarah Scotter in 1875 and subsequently a dispute as to whom she should pay her rent. 1878 It further appears that Burrows continued to operate the business, presumably on behalf of his assignee Gibb, until 1878 when it was sold to Boning and Small, who in the immediately preceding years operated a studio at 10, Verulam Place, St Leonards on Sea. Confirmation that Robert Boning had moved to 22, Baker Street by this year comes from a notice in the London Gazette in June relating to the settlement of his estate following his death in May. See the PhotoHistory Sussex website for a very informative piece on their St Leonards business and their connection with Sophia Rogerson, a sister of the Southwell Brothers. 1880 On 11, 18 and 28 June 1880 Messrs Boning and Small at 22 Baker Street placed advertisements in which the firm announced their intention of destroying all the negatives taken by their predecessors, Southwell brothers, after a given time limit, unless specially instructed by clients to the contrary. Later advertisements in the same publication appeared on 17 September and 8 October extending the deadline as a result of many requests from abroad. A similar advertisement appeared in The Times of 28 September 1880. In consequence of this action, which could almost be described as wanton destruction, examples of the important body of work of the Southwell Brothers survive only in prints, in the main cartes de visite. It is difficult to understand why the negatives could not have been returned to Frederick Southwell, who was still alive at this time – or alternatively to another member of the family, particularly since his sister Amanda Debenham (née Southwell) was also living quite close by and married to another London portrait photographer, W. E. Debenham. In his will in this year, William Southwell, father of the Southwell brothers, left only a nominal sum to his surviving sons Frederick and Edwin. The will further specifies that he is releasing his sons from any remaining debt obligation to him at the date of his death, which suggests that he had been responsible for paying off their debts after their bankruptcy. 1882 According to a death notice placed in The Times on 22 June 1882, Edwin Southwell died at the home of his sister Louisa Robins in Massa Carrara, Italy. 1883 On 5 February 1883 Frederick Southwell died of 'sarcoma of the neck' at Grove Place, Brompton. Thus, like a firework that brilliantly lights up the night sky only to fall to earth almost unremarked, ended the spectacularly successful business which had served the glitterati of the era for more than a decade. For historians it is fortunate at least that so many examples of their work have survived in the form of cartes de visite.